When I learned that the going rate for Star Wars was $4 billion and Disney had forked it over to George Lucas, I wasn't sure that the investment would pay off so quickly. In addition to the cash that The Force Awakens has brought in, I imagine that comic book sales of Marvel's Star Wars line has been quite successful as well. For evidence I will now devote over 2/3 of my weekly post covering the beloved franchise. It would be easy to call this a shameless money grab if the comics weren't so darn good! 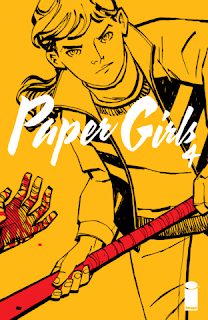 Paper Girls #4 - Brian K. Vaughan is a genius. He not only delivered the best ever having your life flash before your eyes (sooo much time wasted playing Breakout), but he also threw in a Bozo the Clown Grand Prize Game reference to boot. If only I made it on the show I would have landed myself a brand new, crisp, $100 bill. Vaughan is truly the master of delivering a moment that truly connects with his reader and following up with something so far out there that you question what you are reading. This is a good thing and I wish more writers would push the envelope in the same manner that he does. Not only that, but he is one of the best authors in terms of writing strong female characters. I look forward to the day when my kids are old enough to read his work. 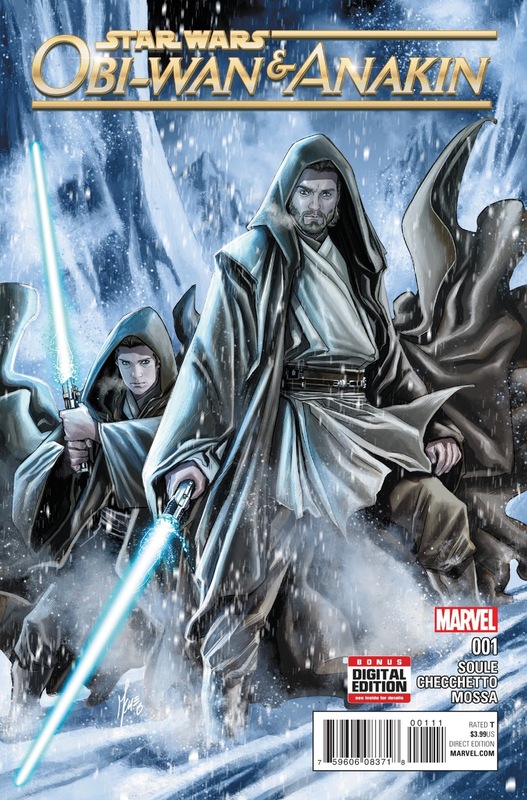 Obi-Wan & Anakin #1 - It's a new year and a new Star Wars title. 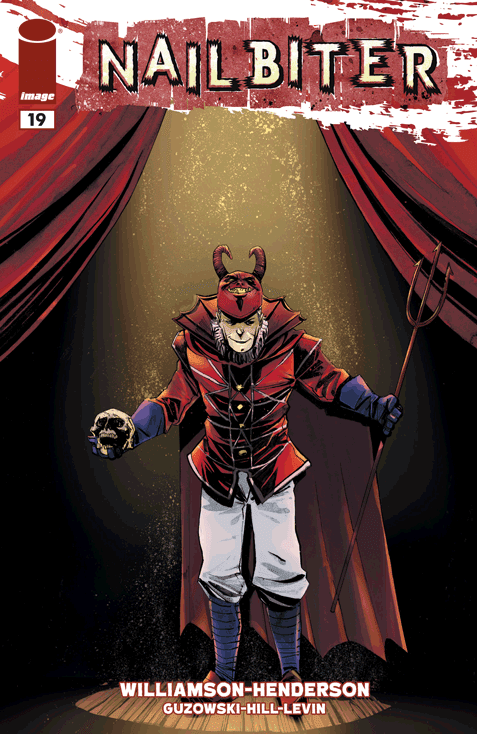 It surprisingly opens with a steam punk arc that is sure to please fans. This story examines what takes place between Clone Wars and Revenge of the Sith. The two Jedi journey to a planet to respond to a distress call. What is surprising is that the planet is thought to be void of life following a brutal war. Enter the zeppelins and steam punk tribes and you start to lose me a bit, but learning more about Anakin's downfall might be worth the ride. We learn that he has had discussions with Obi-Wan about leaving the Jedi Order due to disagreements in philosophy. That will bring me back for the second issue. Hopefully the steam punk planet arc isn't too long. 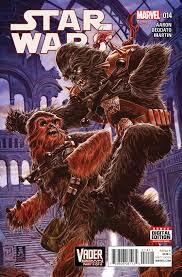 Star Wars #14 - Part 4 of Vader Down is here and things are looking pretty bleak. The arrival of Commander Karbin, the half-Admiral Akbar half-Darth Maul creature, throws a wrench into the plans of Leia and Vader. It turns out that Karbin wants to kill Vader and claim Luke to gain points with the Emperor. To summarize the chaos, Vader is after Luke, Dr. Aphra's droids are after Luke (BT-1 is amazing! ), and Karbin is after Luke. Han Solo and Chewbacca are attempting a rescue, but are thwarted by a Wookiee bounty hunter names Black Krrsantan. Princess Leia, in her attempt to kill Vader in the process, orders a strike on her location to kill Vader and sacrifice herself. Clearly this doesn't happen, but this story continues to entertain. I would love to see Jason Aaron write some of the movie spin-offs. 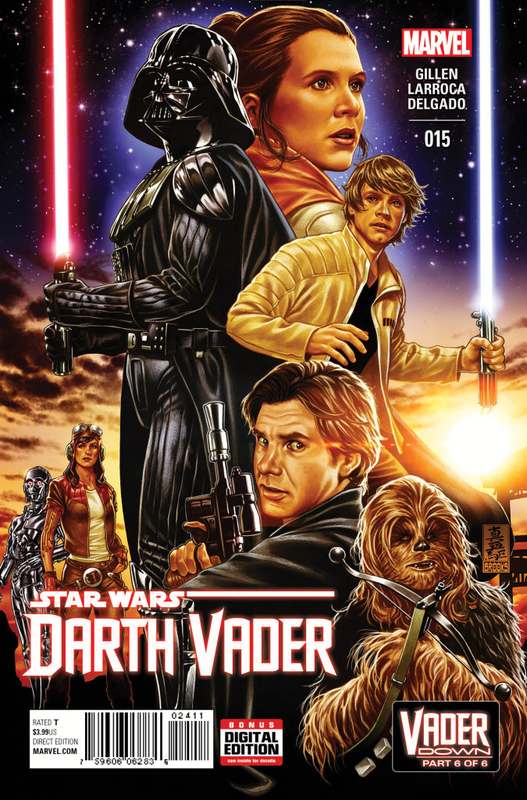 Darth Vader #15 - In what was the shortest cliffhanger in the history of comics, the finale of Vader Down also dropped this week. I will say that I enjoyed the first event of the Star Wars line and thought it had a fitting conclusion. I won't spoil anything, but the more I read about Dr. Aphra the more impressed I am with her as a character. It is also always nice to be reminded about how powerful Vader truly is. I don't think this was conveyed as effective as it could have been in the films, but watching him take down a spaceship with the force is always satisfying. Nailbiter #19 - Very interesting issue this week. While it seems we are getting closer to identifying the Devil Killer in Atlanta (turns out he is killing people who have fled Buckaroo in an attempt to live a normal life), the real action lies in the fact that Crane has now gained access to Buckaroo's records. It turns out that Fairgold is willing to help the FBI, but only if it means that the Nailbiter goes down. Still distraught by the death of his son, I think he will be a character to keep an eye on as we uncover a bit more with each issue.